Stunning butterflies increase in numbers during half term! During the spring half term from Saturday 13 - Sunday 21 February there will be an increase in the number of stunning butterflies flying within the flight area at Stratford Butterfly Farm. Normally there are around 1,500 butterflies but this will increase to over 2,000 due to the longer daylight hours and careful sourcing from the butterfly farmers in the tropics. The Farm is also hosting a number of activities for younger visitors including 'Meet the Mini-Beast' handling sessions each day at 11:30am and 1:30pm so children can get up close and handle insects such as a Giant African Millipede, African Land Snail and Stick insects. Children of all ages can also follow the Jungle Explorers Trail to discover interesting facts about the amazing creatures that inhabit the Farm. What's more, there are plenty of other reasons to visit the Butterfly Farm. Behind the safety of glass tanks are an array of Tarantulas in Arachnoland including the Brazilian Fire Red. The tarantula is native to South America and can grow up to 25cm in length. It is noted for its white striped legs and reddish hairs on the posterior part of its body. It is a terrestrial species that will often make a burrow and it can be quite defensive. Over in Insect City, visitors can admire a Royal Python Snake which originates from Africa and is so named because rulers in Africa would wear the python as jewellery. 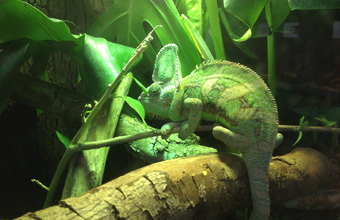 'Archie', is the Farms resident veiled Chameleon which originates from Yemen and Saudi Arabia. Both male and female species have a casque on their head which grows larger as the chameleon matures, reaching about 5cm in the largest adults plus there are a number of Sun Beetles on display from Central and Western Africa. Please note last entry to the Farm in February is 4pm with doors closing at 5pm. To see hundreds of spectacular butterflies, insects, reptiles and spiders visit the Butterfly Farm from 10am every day of the week. Entry fees are Adults £6.25, Seniors & Students £5.75, Children (under 3's go free) £5.25, Family (2 adults & 2 children) £18.50. Group discounts are available. Registered Carers are admitted free of charge. For more information please visit the website at http://www.butterflyfarm.co.uk or telephone on 01789 299288.